Saudi Arabia: MEP Stanislav Polčák (PPE) issued a parliamentary question on the issue of media freedom and the EU Foreigh Policy. On the 31st of October 2018, MEPStanislav Polčák (PPE) addressed the issue of media freedom and the EU Foreign policy in a parliamentary question to HR/VP Federica Mogherini and the EU Commission. On October 31st 2018, MEP Stanislav Polčák (PPE) issued a Parliamentary Question to HR/VP Federica Mogherini on media freedom by EU neighbouring states (in the case of Belarus) or by states that have economic and security ties with the EU and its Member States (such as the case of Saudi Arabia). This question was issued a few days after the European Parliament (EP) Resolution on the killing of journalist Jamal Khashoggi in the Saudi consulate in Istanbul. Jamal Khashoggi’s death provoked much criticism and frustration among different countries, media outlets, international institutions, NGOs and individuals. As a reminder, Jamal Khasshoggi was a Saudi journalist, reporter, author and was the General Manager and Editor-in-Chief of Al Arab News Channel. He began his career as a correspondent for the Saudi Gazette Daily, continuing his career as a journalist for various daily and weekly Arab newspapers until 1990. He was appointed as a foreign correspondent to cover events on Afghanistan, Algeria, Kuwait, Sudan and the Middle East from 1991 to 1999. 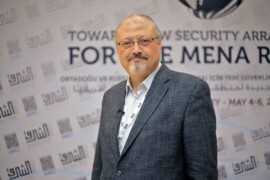 Khashoggi served as editor for the Saudi Arabian newspaper Al Watan, considered the pioneering reformist newspaper in Saudi Arabia. For decades, he was close to the Saudi royal family also serving as an adviser to the government until Khashoggi criticized the arrests of human rights defenders and the reform plans of the Crown Prince, and lived self-imposed exile in the US. In fact, as stated in the EP Resolution, his murder may be linked to his criticism of Saudi policies in recent years. More specifically on the recent announcement of social reforms campaigned by the Crown Prince Mohammad bin Salman as part of his Vision 2030 project. However, this extensive international public relations campaign has been accompanied by an increasing crackdown on human rights, its activists and defenders along with journalists and lawyers who contradict the regime and its new policies. These people have been subjected to arrests, threats, prosecutions as well as harassed and tortured. The EP Resolution condemns the torture and killing of Jamal Khashoggi urging Saudi authorities to disclose the whereabouts of his remains and recalls that “the systematic practice of enforced disappearances and extrajudicial killings constitutes a crime against humanity”. The resolution calls for an independent investigation and, on those responsible, to be identified and brought to justice, following international standards for a fair trial with international observers presents. condemns more broadly “Saudi authorities’ ongoing harassment of human rights defenders, activist lawyers, journalists, clerics, writers and bloggers both within and outside the country, which undermines the credibility of the reform process in Saudi Arabia” encouraging the Kingdom to take necessary steps to allow the exercise of rights freely and without judicial harassments. Can the High Representative of the EU for Foreign Affairs and Security Policy say how she will respond to these cases? How will the EU’s policy change towards countries that persecute journalists, and what specific steps will be taken against them? In a reply to Mr.Polčák, HR/VP Federica Mogherini stressed on the EU’s support for “free and independent media and opposes any measure that would hinder the safety and security of journalists, bloggers and other media actors.” She also addressed the issue of Jamal Khasshoggi’s death by recalling that she had stated in two declarations issued on behalf of the European Union, the EU position’s on this particular case. These declarations highlight the importance of accountability and of undertaking a thorough, credible and transparent investigation. She also specified that she is closely monitoring the situation and any developments and “ogether with the EU Member States within the Foreign Affairs Council, will consider the most appropriate action, in coordination with international partners, once the results of the investigation emerge”. The European Centre for Democracy and Human Rights (ECDHR) welcomes the Parliamentary Questions issued by MEP Stanislav Polčák. ECDHR is pleased that the European Parliament and its MEPs along with the European Commission and the EU Member States have expressed their concerns over the detoriation of human rights in Saudi Arabia and the ongoing repression of freedom of expression and freedom of the media. However, even if the European Parliament and the European Commission haveexpressed a strong and determined position against Saudi’s authorities, the continuous violation of human rights, the continuous arrests, persecutions against journalists and activists requires more concrete actions: cosmetic reforms can no longer cover the fact that Saudi Arabia is committing rampant and systematic human rights abuses, including shuttering freedom of speech. Please find below a full copy of the question of MEP Stanislav Polčák and the response of HR/VP Federica Mogherini. Question for written answer to the Commission (Vice-President/High Representative), submitted by MEP Stanislav Polčák on October 31 2018. In recent weeks, we have been confronted by a large number and broad variety of interventions — some less brutal, others more so — in media freedom by states that either neighbour the EU (in the case of Belarus) or which are linked to the EU or its Member States by several economic and security interests (Saudi Arabia). Answer given by High Representative/Vice-President Mogherini, on January 10 2019. In line with the ‘EU Guidelines for Freedom of Expression online and offline’(1) and the ‘EU Action Plan on Human Rights and Democracy 2015 — 2019’(2), the EU supports free and independent media and opposes any measure that would hinder the safety and security of journalists, bloggers and other media actors. The High Representative/Vice-President (HR/VP) clearly stated the EU position with regard to the killing of the Saudi journalist Jamal Khashoggi in two declarations issued on behalf of the European Union(3) (4). In these declarations, the EU called for a thorough, credible and transparent investigation and advocated accountability for all those responsible for Mr Khashoggi’s murder. The HR/VP is closely monitoring developments, and together with the EU Member States within the Foreign Affairs Council, will consider the most appropriate action, in coordination with international partners, once the results of the investigation emerge. Following recent events in Belarus, the EU has used all possible occasions and high-level meetings to bring its concerns related to respect for fundamental freedoms, including the freedoms of speech, expression and of the media, to the attention of the Belarusian authorities. The Commissioner for European Neighbourhood Policy and Enlargement Negotiations and the HR/VP underlined(5) that recent actions restricting the freedom of expression in Belarus are in breach of Belarus’s international commitments and will continue to closely monitor the situation in this regard. The EU stands ready to assist Belarus in meeting its obligations in the area of democratisation and full respect for human rights and fundamental freedoms and for this purpose the EU will upgrade its financial support for enhanced professionalism of the media in Belarus.